I believe in the potential for walking and bicycling to make our cities more livable for all while responding to some of the most significant environmental, energy, and mobility challenges of our time. It’s highly satisfying to be part of a team that works to increase people’s transportation options and leverage the manifold benefits of investments in active transportation. Collin is a planner who bridges the gap between planning and design. He brings a diverse skill set that includes research, technical writing, policy analysis, multi-modal concept design development, cartography and spatial data analysis, graphic design, project management, and program implementation. Collin has a nuanced understanding of the planning and design processes at a multiple scales, and excels in multidisciplinary collaboration. 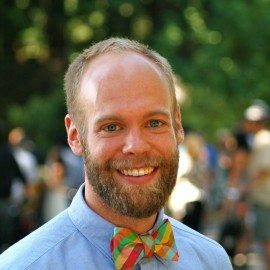 His work includes bicycle and pedestrian master plans, Safe Routes to School plans, Complete Street corridor plans, greenway feasibility studies, and multi-modal design guidelines.